Last Wednesday I attended a huge corporate event which completely wiped me out but was defiantly worth it! (Link) During the day we heard from ex world leaders, got entertained by A listers, and whilst all that was amazing what really struck a cord with me was the speech that Martine Wright gave, she is such a true inspiration. Who is this Martine Wright you ask? Well to be honest I had no idea myself when she stepped on stage, but still her story really stuck a cord and brought both tear to my eye and a smile to my face. Martine was a high flying marketing executive busy wrapped up in her own crazy busy life, until the day on July 7th 2005 when she got on a tube whilst running slightly late for work, sitting reading in the metro about how London and just being awarded the 2012 Olympics. What she didn’t notice or realise at the time was that the man sitting opposite her with his rucksack (full of explosives!) had intentions to cause mass casualties and disruption to London’s rush hour traffic, and he succeeded. Martine was found after two days of lying in the rubble; one of the last survivors to be discovered. She had lost around 80% of her blood and was put in a medical induced coma for around 10 days. When she woke up she had the shock of not only what had happened but also that both her legs had had to be amputated above the knee. Needless to say Martine did not have a positive attitude at this point! Continually thinking why me? Why did I get on that train? If only I had been on time! With the over all theme of ‘My life is over’. Martine didn’t stay like this however, she explained how she had a very distinctive turning point. For her this was when she was finally well to go to the hospital physio. Up until this point she was unaware that 52 people died in the 7/7 attacks in which she had been injured, and that gave her the perspective of how that number could have so easily been 53, so she needed to make her life count. But also there were others around her who were in a worse position including a girl who had lost both arms and legs to meningitis and still had a smile on her face. This made Martine determined to not let this define her and to push through blood, sweat and tears to recover. And I know that those of us with CFS/ME it isn’t about pushing ourselves to the point it harms us, but that having the right mindset (Link) is so crucial. If Martine hadn’t at that point got out of the mindset of I can’t do anything, she would probably be still lying in bed not doing anything for her self. 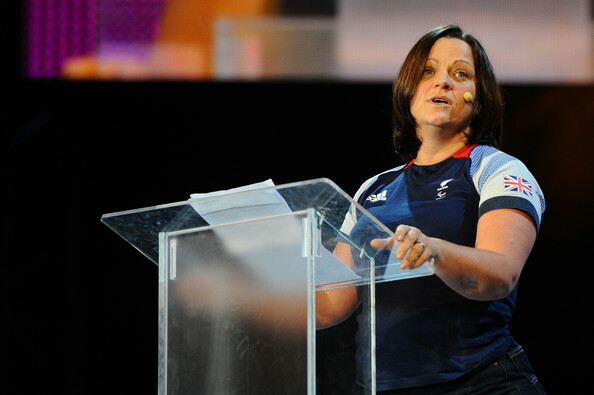 Instead of STANDING in front of over 13,000 people telling her story of how she went from hospital bed to Paralympic Athlete (Seated Volleyball) where she competed during London 2012. She truly is awe inspiring! But what shocked me the most was that if she was able to turn back the clocks now and not get on that train, she states that she would still get on it. As she so strongly believes that: everything happens for a reason and that she was meant to get on the train. Life can change for the good and the bad you need to accept changes to enable yourself to move on in life. She was so determined to make her life different and to grab every opportunity going forward, so that some good could come out of such tragedy. For her, which I defiantly can relate to and I am sure many CFS/ME sufferers can relate to is that for her one of the hardest things to over come was to stop looking back at memories of what you used to be able to do. Accept where you are now and that things need to be different but that doesn’t make them bad. This actually was highlighted to me further yesterday when I attended Toby Morrison’s UK seminar (Link-Coming Soon), where one woman attending said that she no longer wishes that she hadn’t fallen ill with this disease, as it has made her reevaluate her life, she has changed jobs, her and her husband are closer and in fact she now is the healthiest and happiest she has ever been. So who’s on your Team Me? (Link) and who’s Team Me are you on? If you want to see a speech from her for yourself she did a ted talks back in 2011 a year before she managed to compete for GB in London 2o12. « The Ugly Truth of Bad Day with CFS… But its ok! What a great post and inspirational story. Thanks for sharing.